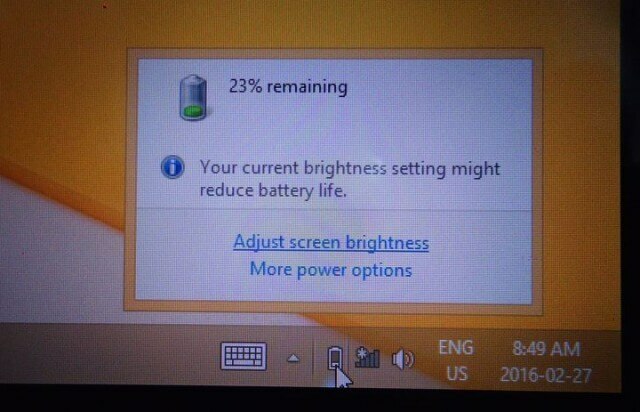 A couple days ago a guy bought me his Surface (RT) tablet running Windows 8. From the description of the issue as he explained it, the problem seems to be that it powers down fine when they are not using it but then won’t wake up. In theory, just clicking a button should spark it to life but he told me told it usually takes 2 days before anything will happen. Apparently, this is a fairly common Surface issue. Since Windows XP, I’ve had problems with Windows going to sleep and occasionally freezing up in that state with the only way out via a reboot. I’ve also witnessed this issue on other people’s computers as well. Usually rebooting will clear this out (until it happens again). Which leads to the next issue, fast reboot. Most computers, including tablets are designed to startup quickly – as far as I’m concerned, a big mistake. 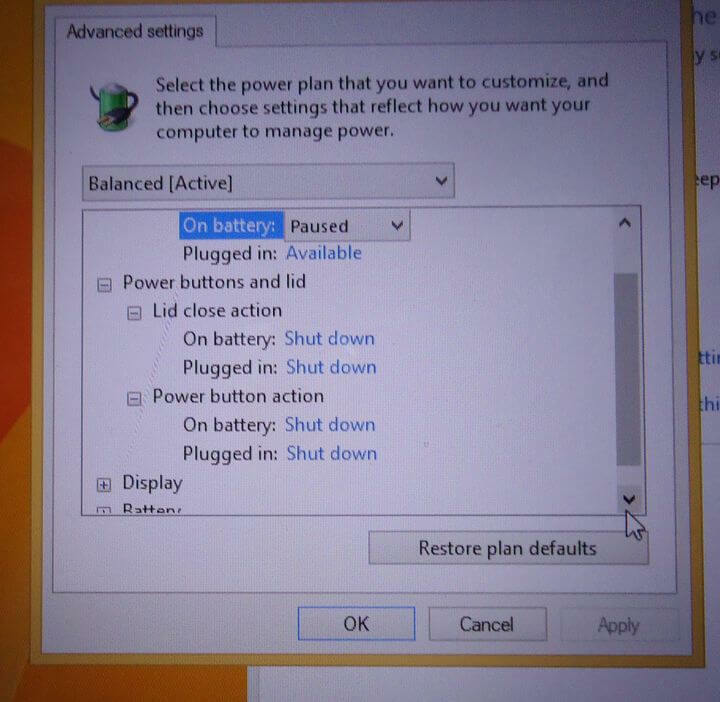 To force a laptop to reboot completely you usually have to power it off by holding down the power button for 5 seconds. 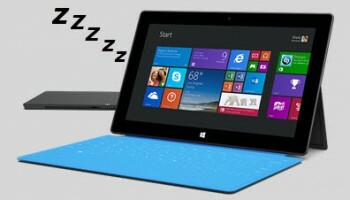 With these Surface tablets you have to hold the power button for 30 seconds. I might be wrong but I’m pretty much convinced that if they’d tried that they would not have to wait 2 days for it to clear out. My guess here is that it takes 2 days for the battery power to wear down and that then forces a complete reboot. By the way, scans for malware came out clean. Hard drive and memory all check out as well. What’s your opinion? Unable to find any obvious causes, I decided to disable the sleep options, by clicking on the battery icon then clicking on More power options > change plan settings > then the options for Put computer to sleep, I changed both to Never. Then clicked on Change advanced power settings and found the Power button and Lid section – clicked on the blue letters and changed them all from Sleep to Shut down. That way if it gets stuck again they might be able to clear it out by just shutting it down. Not a perfect solution but a workaround which should at least get them out of trouble. Prev:Which Free Antivirus is Best? Terry is a self-taught computer aficionado, who after being exposed to Windows 3.1 in the early 1990's devoured every book and magazine on the subject he could get his hands on. A published author with over 20 years' experience building and servicing computers for friends and family he started his first website in 2002 at Hit Any Key. That is not a healthy state, when the PC won’t reawaken from sleep mode. Doing a repair reinstall of Windows may fix it – but your ‘solution’ is only a stopgap measure. I don’t have that problem on my Acer Notebook, and it is going on five years old. There may be some process running in memory that is incompatible with sleep mode. More trial and error is needed, to find the culprit – and if nothing else works, a fresh install of the O.S. might. I have noticed, when a USB device is attached, say, an external drive – that can cause the PC to have problems reawakening from sleep mode. The simple solution in that case is to unplug the USB device before going into sleep mode. Thanks for your reply but on my desktop I never considered this issue a big deal. My biggest concern now is with my desktop CPU fan just decided to get a lot louder than usual. I’ll probably have to replace it.